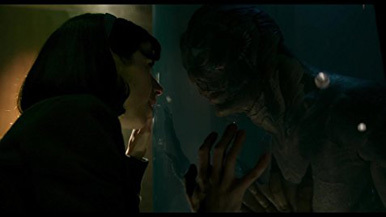 The Shape of Water won Best Picture and three other Oscars, becoming only the second movie in the last five years to win both the Directing and Picture prize when Guillermo del Toro was named Best Director. It was last done by his friend and collaborator, Alejandro Gonzalez-Inarritu for Birdman three years ago. The fantasy about a woman who meets a merman in a lab in the 1950s also took home Academy Awards for Best Original Score and Best Production Design. In triumphing at the 90th Oscars, The Shape of Water survived a last minute onslaught by Get Out and also a last minute move towards Three Billboards Outside Ebbing, Missouri, which several of us predicted based on the strength at the Globe, the SAG, and the BAFTA, and given that The Shape of Water did not have a SAG Ensemble nomination, a statistic that now has been broken for the first time in 23 years. One can speculate and will never know, but if you ask me, the Academy was not completely sold on a horror thriller, Get Out, though they still gave the movie Best Original Screenplay, with Jordan Peele become the first African-American director to win the award. And it was likely not convinced that it wanted to go into the controversy of a movie like Three Billboards Outside Ebbing, Missouri, a movie that had rubbed some people the wrong way given its race, brutality, and abuse themes. The Shape of Water had triumphed at the preferential ballot PGA earlier this year, which regained its crown as the lead predictor of the Academy Awards. Still, the Martin McDonagh dark comedy won two Oscars, for Frances McDormand as Best Actress and Sam Rockwell as Best Supporting Actor. Gary Oldman and Allison Janney won the other two acting awards, with Darkest Hour also winning for Best Make-Up. Other than what, to me at least, was a genuinely surprising outcome with The Shape of Water’s win, the rest of the night went more or less as we had expected and predicted. Dunkirk did well, winning three tech Oscars including two for sound and one for Film Editing. Roger Deakins broke a losing streak of 13 straight, finally winning an Oscar for Best Cinematography, the second for Blade Runner: 2049, which took home Best Visual Effects Oscar. Coco also picked up a couple of awards, for Best Original Song and Best Animated Feature. The Best Foreign Language Oscar went to Chile, for the trans drama A Fantastic Woman. Call Me By Your Name won for Best Adapted Screenplay. The ceremony was also notable for the political speeches, particularly around inclusion and the #MeToo movement. It has become a tradition that the awards show feature the issues of the day, and they were done in respectful and interesting ways this years. I can say only one complaint, that I wish they had done more to celebrate the 90th year of the Academy Awards. As for how I did in my picks, I did better, and was glad that I stuck with the two shorts I liked, The Silent Child and Heaven is a Traffic Jam. We will be back in a couple of days to analyze what this year teaches us about the Academy, and put a bow on it!